We are proud of our children’s sporting achievements – our ethos is to be the best that we can be so we challenge the children to improve in everything they do, show good sportsmanship and play fairly. 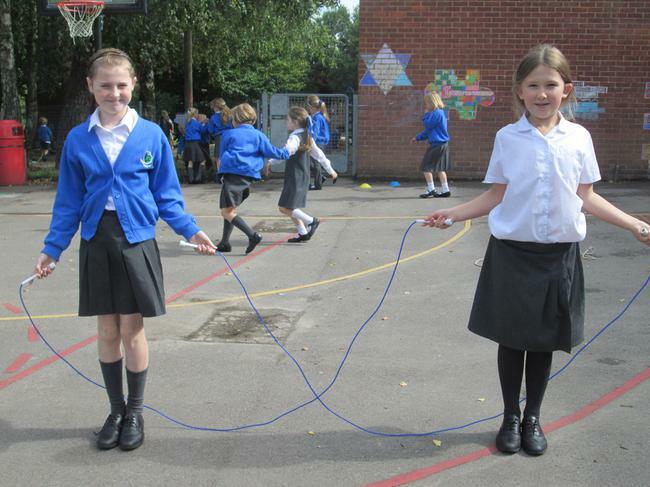 Zara and Nicole challenged themselves to 'double skip'. Now the playground is full of children attempting the double, treble and even quadruple skips!! Currently we aim for 2 hours of PE every week – this is a REAL PE session plus a more sport focus session with Mason, our sports coach. REAL PE is based around agility, balance and coordination and is the foundation for all competitive sport. This weekly session is taught by class teachers. Mason is our sports coach who works with most of the classes each week to offer sports specific skills. This term Hornbeam Class are having swimming lessons at Tadley Swimming Pool culminating in a Gala on Thursday 8th February. We offer rugby, netball, fun fitness, football (through an outside agency called GOL) and Dancephaze sessions. We aim to enter the same range this year. This year Harry and Holly are our ambassadors this year. Both have taken the role very seriously - they are ensuring teams are organised for the various competitions we are entering, have ordered new equipment to give the children more options for playtime and have instigated a 'Sports Class' of the week. This is chosen by Mason and has a focus on the children being the best they can be, being respectful and supporting each other. The receiving class is provided with a sports focus at privilege playtime organised by Harry and Holly - a great idea which is working well. Swimming - Hornbeam Class (Year 5/6) had swimming lessons twice a week culminating in a Gala on February 8th. All the children improved their skills, stamina and had fun along the way. Sparkling Rugby - Roger Filbey begins his sessions with Key Stage 2 children training them in the skills of Tag Rugby - this is weekly on a Tuesday until Easter. 1st March - Basingstoke and District High 5 Netball - postponed due to snow. 8th March - Year 3/4 rugby. Mr Dixon took the team to the competition at Newbury Rugby Club - what an amazing day they had. The children won all of their games. Mr Walker took the team to a Hampshire competition. The team played well and qualified for the county finals next month. Mason and I took a team to Elstree for the afternoon. It was a tricky afternoon but the children played very well winning some games, drawing and losing. We didn't manage to get to the finals but were a delight to be with. Mr Dixon accompanied the Sports Ambassadors, Harry and Holly plus Rupert and Evie from Year 5 to celebrate the fact that Ashford Hill School were awarded the Sainsbury's Gold Mark for sport in school. We are delighted to have received the award for the second year and more so being invited to a celebration. They children took part in various activities at the centre and their photograph was used as a follow up by the company who organised it - see photo and link below. This year I challenged the children to run a marathon as a year group (I also included the staff in this). Mr Walker and I measured the cricket ground and worked out that if each year group ran the perimeter 80 times this would equal a marathon. My goodness did our children run - they completed over 800 laps equalling 10 marathons. We had Mason (our sports coach), parents and younger siblings supporting us by cheering and running alongside. The whole school were amazing - older children walking and running with our younger children supporting each other, congratulating each other and what was even more amazing is that we raised over £1,100 for Sports Relief. Well done to all. This term has begun with a mass of sporting events. Thursday 19th April - Mr Walker took the Year 5/6 netball team to the county netball finals. We were very proud and delighted to have qualified for the Hampshire finals in Basingstoke. The competition was tough, the weather very hot, the children played well, fought hard but sadly were outplayed on the day. Tuesday 24th April - I took a team of Year 5/6 children to Park House for an Orienteering competition. Sadly Finlay was poorly and unable to make the team so at the last minute Arthur (Year 3) filled in as he was coming to watch his sister Myah take part. My goodness did those children run - the fastest time by any pair was 7 minutes 13 seconds, Harry and Holly came in at 7 minutes and 36 seconds. After all 6 pairs of children had competed we waited expectantly for the scores - how delighted we all were to receive the silver medals. Well done to all 12 of our competitors. Thursday 26th April - Mr Dixon took a team of Year 3/4 children to the Sparkling Rugby Tournament at Overton Rugby Club. The team did very well winning the first match 8-0, the next 4-0, the next 3-1, the next was a draw and finally they lost 1-3. Overall a very good day - good team work, sportsmanship and returning back to school with their heads held high. Friday 27th April - Mr Dixon took a team of Year 5/6 children to the Sparkling Rugby Tournament. Sadly the weather was not so good, a few of our regular team were unavailable but they played well with a mixture of results.